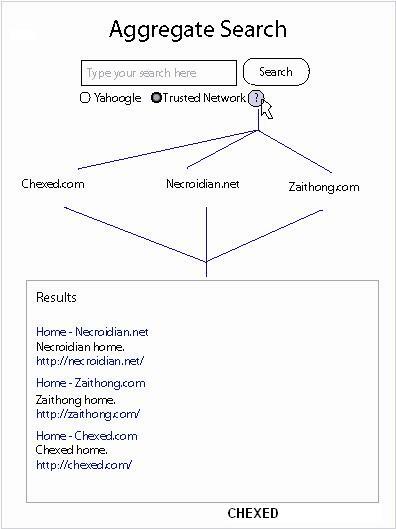 Something I feel confident a lot of web masters would use is an aggregate search function for Yahoo Search or Google Search. From what I've found, I would say Live Search is lacking far as services for web masters. Maybe they have a plan, I'm not sure. The idea is basically a feature that someone can search more than one select number of sites at a time. For example, some of my trusted friends have websites, and I would feel comfortable having the search on my website retrieve results from their websites as well. Right now though, adding multiple websites, you have to search each one separately, and it also makes the search box look like a giant mess when there's multiple websites. I've included a diagram that further depicts this suggestion. You you can look at the picture if your a visual learner, imagine building the feature using the diagram if you're a tactile learner, and read the words aloud if you're an auditory learner. This feature will help organize websites and link related pages and/or entire websites together. (Yes, I did just suggest there that perhaps individual pages could be searched). Hosted by HostNine This page was created in 0.00420212745667 seconds.